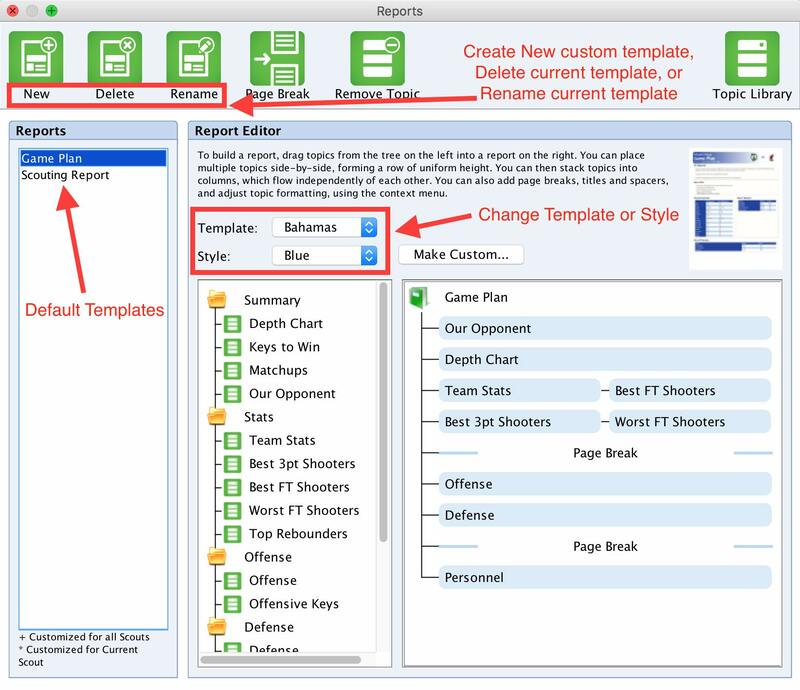 Scout - A Scout is created for each game against each upcoming opponent, such as Atlanta Game 1, Boston Game 2, etc. Report - Within each Scout that you create, a Report template is used to control how your completed Scout will look. 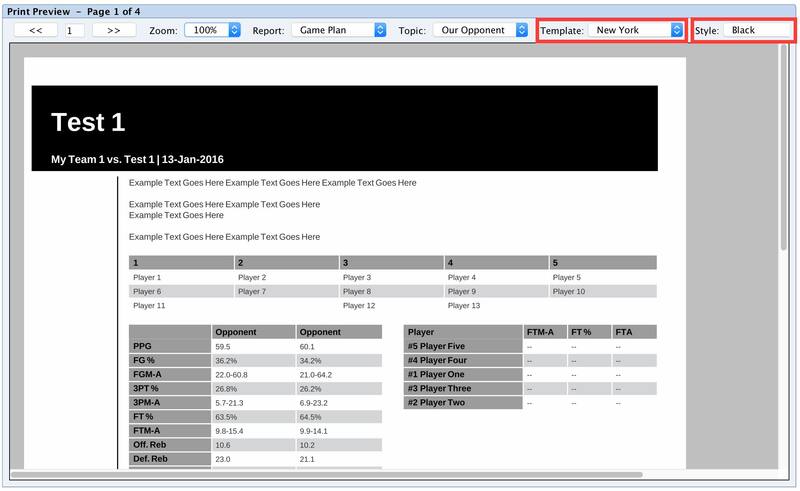 You will be able to choose from the default FastScout Reports ("Game Plan" or "Scouting Report"), or create a custom template for your needs, such as a personnel report. Topic - Topics are contained within the Report (such Offensive Keys, Team Stats, Personnel, etc.). The content of each Topic can be entered or edited within the Scout tab, while the order and layout of the Topics in your Report can adjusted within the Preview tab by using the Report Editor. By clicking the Preview tab in FastScout, you can view how your Report currently looks with the information that you have added in your topics. From here, you can also make quick edits to the layout and color of your report, or open the Report Editor to make more in-depth changes to your template. In the Print Preview window, you can make quick edits to your template style or color by using the drop down menu along the header bar. To make more substantial changes to the layout of your topics or to change which topics are included in your report, click the Reports icon near the top. In the Reports window, you will see a list of your available reports in the left side window. Using the icons at the top, you can also create a new Report, Delete an existing Report, or Rename a current report. From this window you can also edit the Template and Style of the Report again. 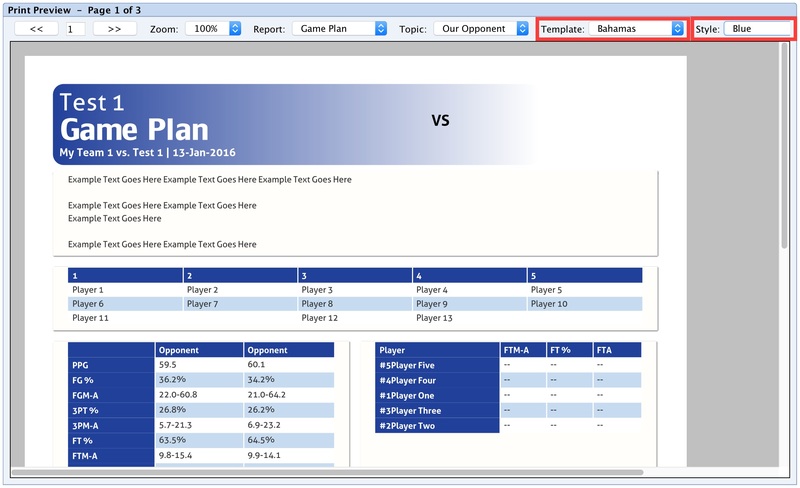 When you have selected a Report, Game Plan in this case, you can use the center and right side windows to edit which topics are included in the report, the order of the topics, and how much space they take up on the page. Remember, these Reports act like templates, so any changes that you make to the Report will affect each of your Scouts. 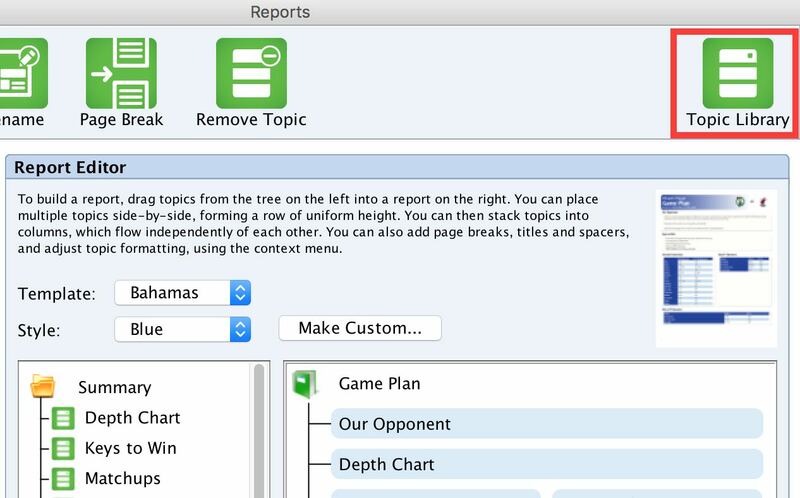 To add a Topic to your Report, drag the Topic from the center window into the Report where you want the Topic to go. To Delete a Topic, right-click on the Topic and select Delete. 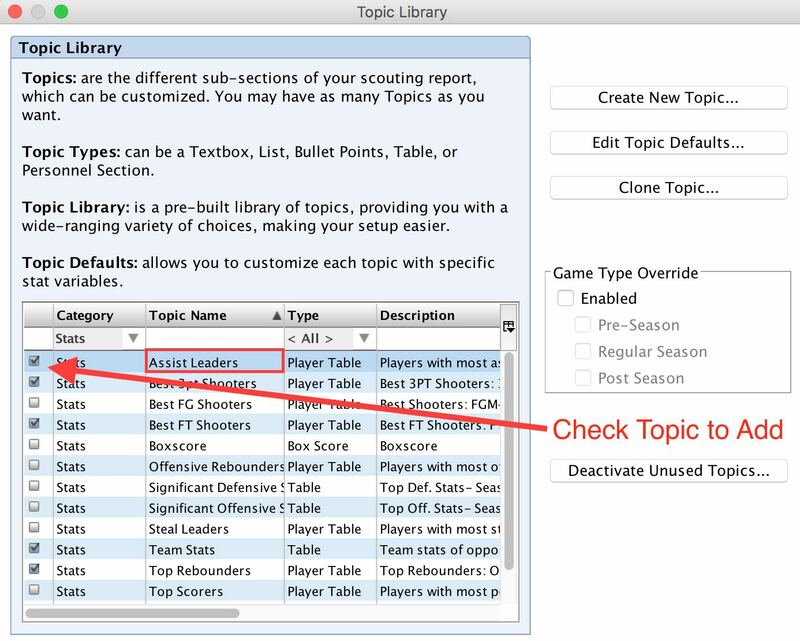 To move a Topic, drag and drop it to a new line, or next to an existing Topic to create two topics in the same row. In rows that already contain two Topics, clicking and dragging the small dash will allow you to change the amount of space that each topic occupies in the row. The default is 50-50, and as you move the dash left or right you will see two numbers appear that will tell you what percentage of the line that each topic will occupy. 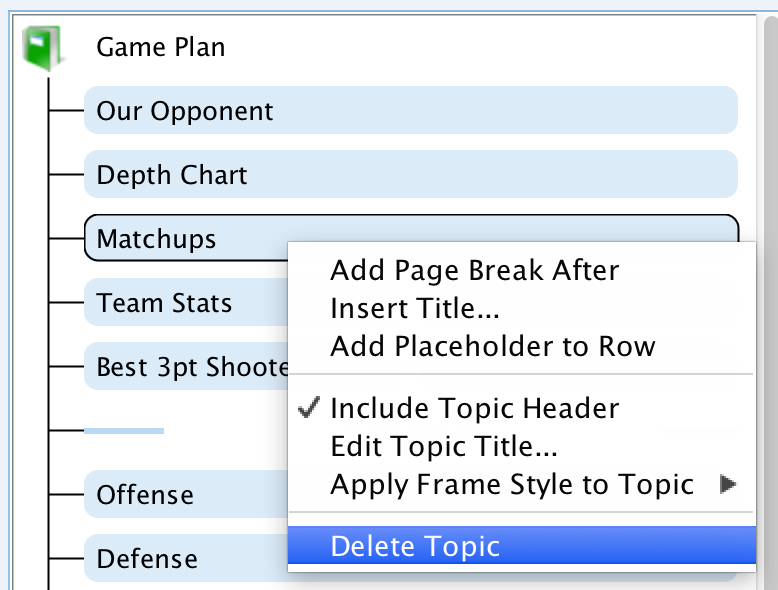 When you right-click on a Topic, you will also see an option that says "Include Topic Header". When this option is checked, it will include the name of the Topic right above it in the Report. When you click the option to remove the check mark, the header will no longer be included above the Topic. Lastly, if you would like to add a Topic to your Report but do not currently see it listed in the center window, click the Topic Library icon to open the Topic Library. In the Topic Library, find the Topic that you want to add to your Report and place a check mark next to it to activate the Topic. When you close the Topic Library window, your new Topic will now appear in the center window and you can drag the topic into your Report.